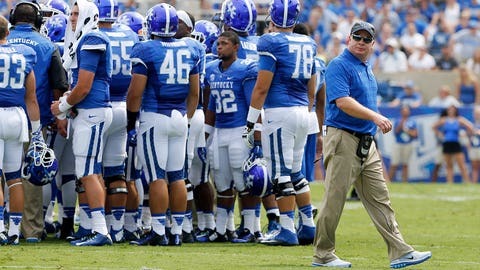 Mark Stoops made a nice pickup over the weekend. Kentucky has reportedly picked up another former four-star prospect days after signing day. Rivals.com reports former Michigan receiver/defensive back Brian Cole has decided to continue his career in Lexington. Cole, a four-star recruit from Saginaw, Mich., in 2015, played two games as a true freshman for the Wolverines last fall. He caught one pass for a loss of a yard against Utah in the season-opener. Cole reportedly spent some time at safety during practice later in the season, and he told Rivals it was not certain which side of the ball he will play on for the Wildcats. “I'm truly blessed and it's an honor to be able to go to school there,” Cole said. Scout.com ranked him the No. 1 receiver in the state of Michigan during his senior season at Saginaw Heritage High School.